My friend Kent Griswold had a very busy day traveling up and down Sonoma County. He visited pretty much every local tiny house builder. Read about his busy day at Tiny House Blog. The most exciting part was a visit to Jay Shafer’s place where Kent found a complete Tumbleweed Fencl that Jay will be taking on the road in just a few days. Jay is hitting the road for a coast to coast adventure. He’ll take this tiny house from San Francisco to New York meeting the press, giving workshops, and in general spreading the tiny house story. If you missed the construction of this tiny house you’re in luck. Kent took photos the whole way through and has posted them all online. 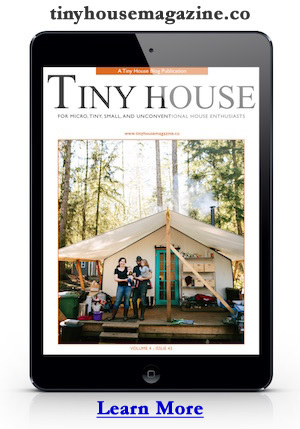 Take a look at Tiny House Journal for the complete photo record. Here’s a peek at the completed tiny house. This entry was posted in Tiny House Projects and tagged fencl, jay shafer, Kent Griswold, tiny house, tiny house blog, tumbleweed, tumbleweed tiny house company. Hi, I am from sweden and I wonder what rules you have in USA, how fast are you allowed to drive with a tiny house in tha back and do you have to have a special driving license? The speed limit for trailers is different for different states. There is no special license for towing a tiny house sized trailer. Generally if a trailer exceeds 13.5 feet in height or 8.5 feet in width a special site to site permit is required. Are you coming to Rochester, NY?